“Alright already, lady, enough about how you are sure that stress caused your cancer. I’ve been listening to you go on and on about it for like the last 15 minutes.” Such was the dark thought that, unbidden, streamed upwards as steadily and elegantly as a champagne bubble from deep within my id and up into my conscious brain during a recent genetic counseling session. The thought bubble was persistent enough that it interfered with my ability to pay attention to the issues at hand. Fortunately, my eventual awareness of it allowed me to deflate it and let it sink back down to some cryptic neurological crevice. I refocused myself, validated her concerns and explored the sources of her stress and why she thought it may have led to her cancer. A few days later, out for a run, I lapsed into a meditative state and was able to process what happened. My patience for patients had been wearing thin that day – she was late for her appointment, I had yet another too full schedule, the office assistant was out sick, my bus ran late that morning. Bad days and bad thoughts happen; it comes with the genetic counseling territory. We all think that way sometimes (well, I hope I am not the only one). The experience intrigued me enough that I decided to track some more of my dark thoughts during my genetic counseling sessions over the next week. I was amused by my eventual realization that my internal thought voice had an accent and tone that was much closer to that of my Brooklyn youth, whose edge has now been tempered a bit after nearly 4 decades as a NYC ex-pat. Confessing my dark side to the Good Readers of The DNA Exchange is difficult, to say the least. Baring one’s counseling soul is not without its awkwardness. Probably many of you are having more than your usual share of dark thoughts about me. In fact, I am having my own dark thoughts about myself at this point. But I don’t think this means I am a bad counselor or a bad person or a potential Republican presidential candidate. These thoughts are really about the struggle between my professional self and my private self, both of which are multifaceted, changing, and difficult to pin down. 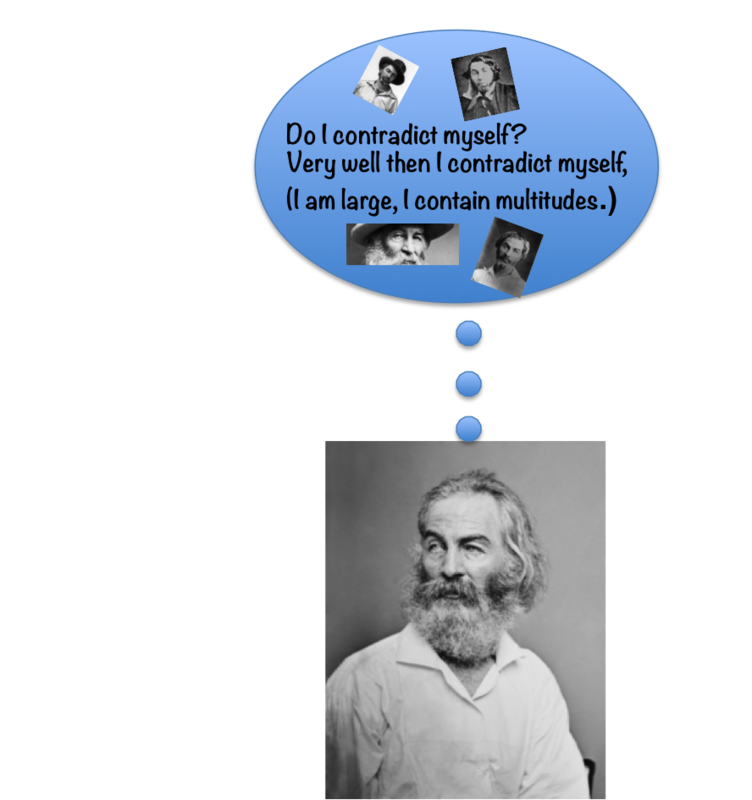 Like my fellow ex-Brooklynite Walt Whitman, my self-song is contradictory, large, and contains multitudes. My dark internal discourse is part of the ongoing, complex, and never-ending evolution of professional development. I don’t necessarily agree with the sentiments of these thought bubbles or think they reflect the “me” that I present to the world. By processing these discomfiting dark thoughts I hopefully emerge a better counselor and a better person, someone who I prefer to believe is ruled more by Good Angels than Lucifers. This requires continual vigilance, learning, awareness of the pressure they put us under, and growth to admit to them so as to understand where they are coming from. No doubt the struggle between the yin and yang of transference and counter-transference is at play here too. The goal is to not let them unconsciously insinuate themselves into the external counseling dialog that we engage in with our patients. Probably I fail at it frequently; yet one more reason why we should pursue professional supervision and openly discuss these issues at our educational conferences. The obvious truth that I can’t lose sight of is that genetic counseling is about patients, not about me, my viewpoints, or my belief that I am so damn right about everything that they should put me in charge of the world. The other truth is that darkness can be turned into a shining light that makes us better people. It is at the core of the human condition, and if we allow it, beauty, self-awareness, respect for humanity, and a deep sense of wonder can transform us. God help the beast in us all.